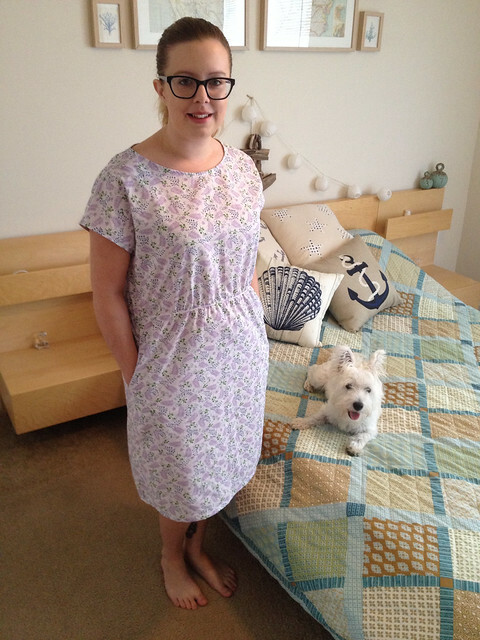 With my recent success at using printed PDF patterns, I bought the April Rhodes Staple Dress pattern. I had seen this over on Camilla’s blog and loved the shape, and she had told me that it was a fairly easy make. Sounded great to me! 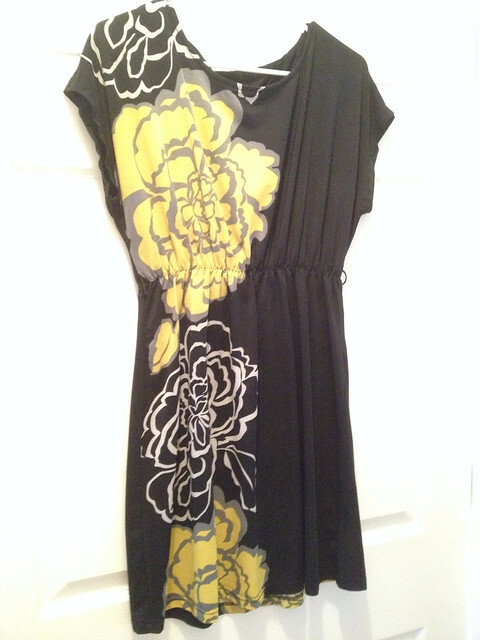 I’ve had the dress below (sale special from New Look!) in my wardrobe for about 5 years and it’s still one of my favourites; the shape is just sooo comfy and flattering! I had high hopes for this one! I was an immediate fan of the pattern as there was only 1 piece for the front, 1 piece for the back and the facings pieces. 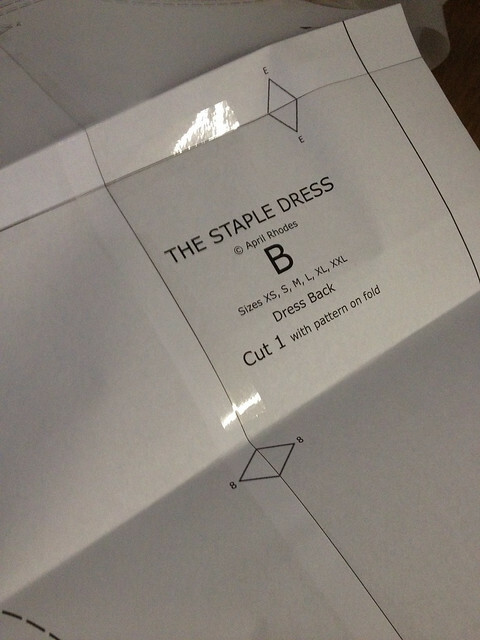 I inserted pockets and constructed the dress, ready for elastic, in around an hour. This pleased me quite a lot. For the gathered waist, the pattern recommends using elastic thread but does give an alternative for if you haven’t got any. I didn’t have any elastic thread so went with a 1/4″ width length of elastic, stretched it around the waist and stitched in place with a zig-zag stitch. This is when the dress started to disappoint me a little. 😦 I think that my tension may have been set a little too high as when I was finished with the elastic stitching, it stayed quite stretched out and didn’t really gather! I think my piece of elastic was a little too long so that didn’t help either. I still like the dress; even though it is a little tent-like, it is very comfy. I think it looks much better with a belt. Next time though, I think I will be cutting the smaller size and maybe casing the elastic around the waist instead….and using a smaller piece!! Very cute with a belt. The fabric is pretty. And did you make the quilt on the bed? It looks better with the belt anyway, as your waist is more defined. Very pretty, feminine print too, which suits you a treat. 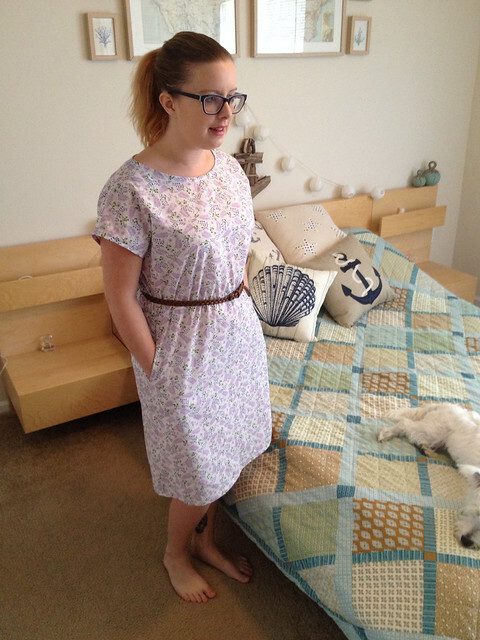 I love the staple dress — but i used elastic thread in mine and I did more than recommended for a cinched waist. This does help with the tent-like aspect! I like the sound of elastic thread but it scares me a little as I’ve never used it before 😳 I will be trying to get some though to see if I can perfect this pattern! Your dress is very cute. It does look better with the belt.